So I spent last week surrounded by 20th-century icons who did some of their best work in the later chapters of their lives. First there was the visit to see Matisse's maquette for Nuit de Noel, 1952, currently installed at the High. His works with simple, brilliantly-colored cut paper (which led to the famous stained glass windows) were initially a sort of creative adaptation to his increasing physical limitations, but are now among the most powerful and memorable pieces in modern art history. I followed up by reading Rosamond Bernier's humorous accounts of her early visits with Matisse. 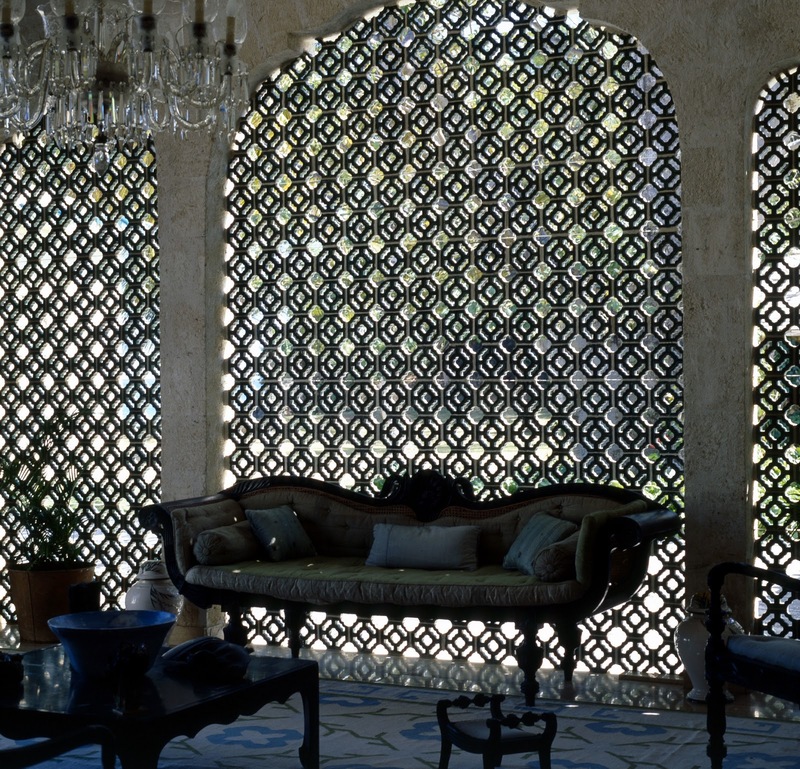 As a young features editor with Vogue, she was the first to write about Matisse's magical designs for the Chapel of the Rosary in Vence. And of course Bernier herself has had an incredible second act sharing her passion for art with audiences around the world. 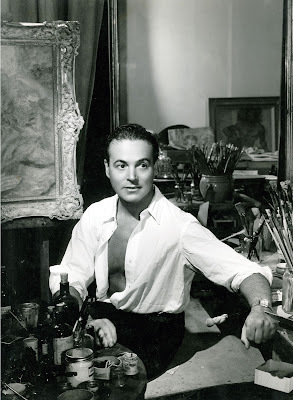 Then there was Oliver Messel. I was swept away by a new book about the acclaimed English theatrical designer. 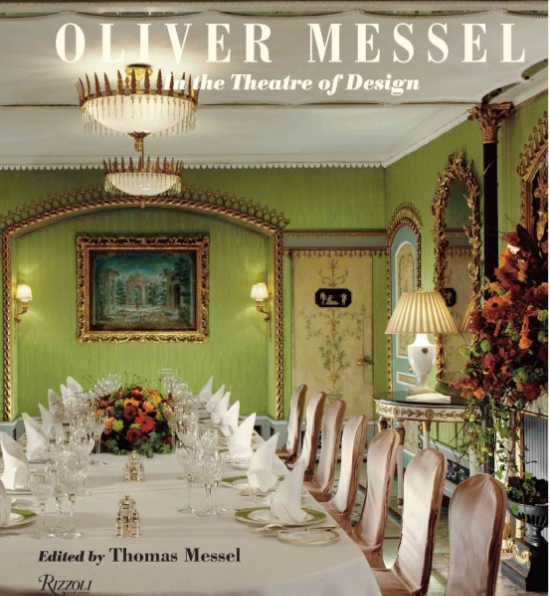 Edited by his nephew, the furniture designer Thomas Messel, naturally this large volume explores in detail his contributions to the stage. As a boy at Hawtreys boarding school, it seems he responded to the austere conditions ("Dickensian horror" as he put it) by retreating to a fantasy world of his own creation. A bit later, in the 1920s, he was part of the beauty-and-pleasure-seeking generation coming of age in the aftermath of WW I's ugliness. Soon, the Slade School of Fine Art alum was designing for Serge Diaghilev's Ballet Russes. Oliver Messel's theatre designs oozed glamour, and not the superficial glamour of Hollywood, but the alluring poetic glamour of bewitchment and enchantment, transforming the familiar into something rich and strange. 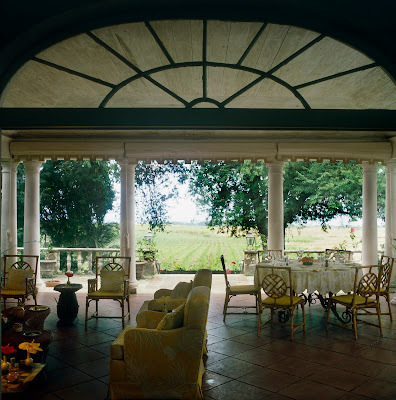 Along with numerous illustrations of his stage work, scrapbook photos of Bianca Jagger, Diana Vreeland, Babe Paley and Penelope Tree, and tributes from Carolina Herrera and other design luminaries, the book explores his interior design projects. 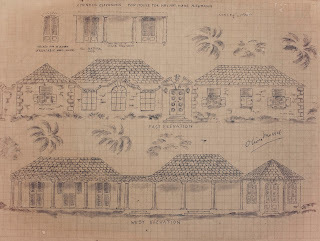 But I was especially thrilled to see lots of pages devoted to Messel's second act: designing real houses on Mustique and Barbados in the 60s and 70s. Hence the island-related preview images you see here. Arthritis eventually led Messel to spend much of his time in the West Indies. 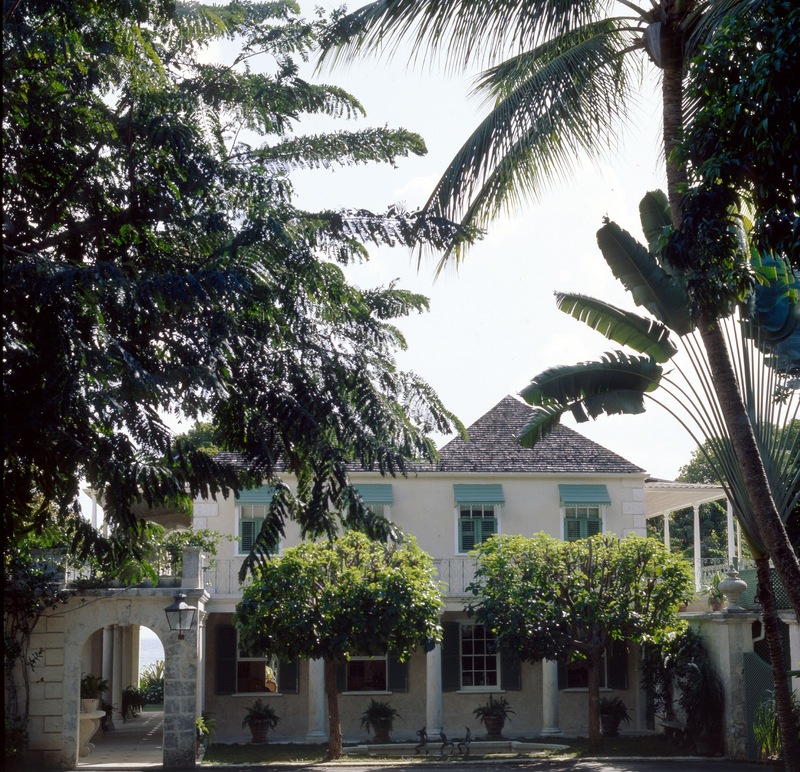 By 1966, he and his partner, Vagn Riis-Hansen, had moved to Barbados. 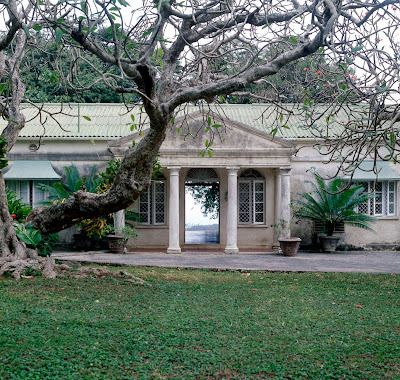 Messel's remodeling and redesigning of Maddox -- the couple's 18th-century seafront plantation house -- caught the attention of high profile visitors and things snowballed. According to the book, no stage designer before Messel (with the exception of Inigo Jones) had become so involved in architecture. 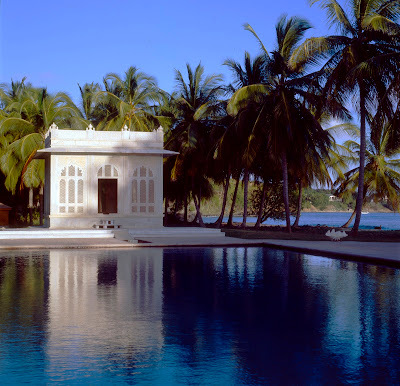 He became known for his use of stone and his own breezy interpretation of the Caribbean Palladian style. The pale sage green he favored for shutters, iron furniture, and woodwork is today dubbed "Messel Green" or "Mustique Green." But his tour de force is considered to be the Turkish-inspired Great House for Lord Glenconner. Directly above is a carved Indian temple imported by Glenconner for the project, and at the top of this post is a view of the ornate screen incorporated into Messel's central room. Roughly 100 pages of the book are devoted to Messel's island period. BTW, classic film buffs are going to be irritated with me for spending no time at all on Messel's Hollywood work. The book does cover this in detail with many nice (not to mention big!) images, including a full-blown rare color photo that shows both Elizabeth Taylor and Messel's design contributions to Suddenly Last Summer. Learn more about Messel over at the V & A. What a beautiful book! 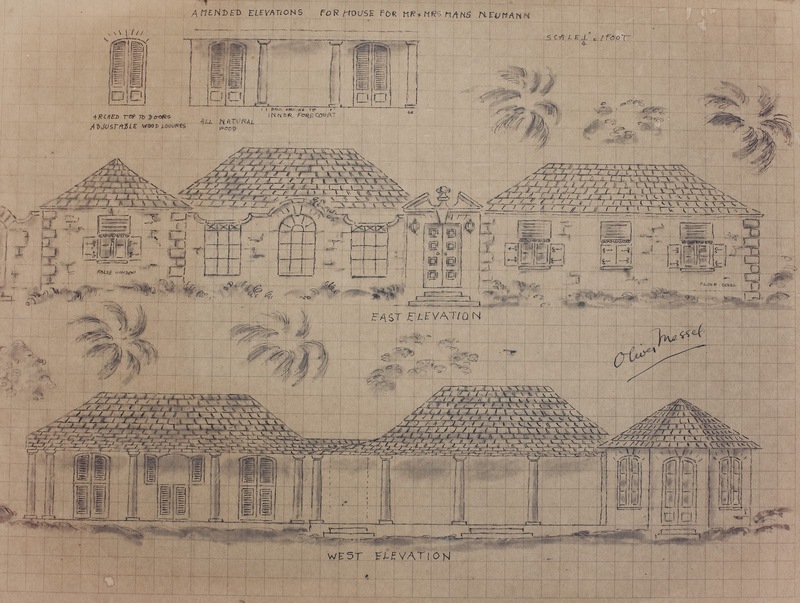 I love looking to the past for design inspirations - lovely post. I am a huge fan of Messel's work, especially those houses in Barbados and Mustique. Great post! I love the comparison Messel makes with Inigo Jones. Thanks for the peek view. I MUST get this book. Looks fab! I have always been a huge fan of Oliver Messel and I am so glad that there is finally a new book. 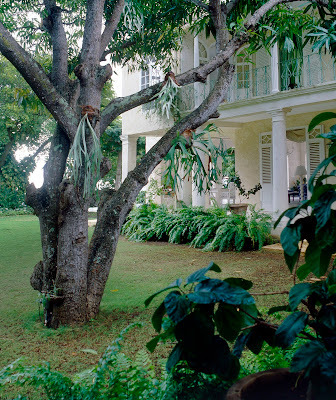 More years ago than I can count, I saw Penelope Tree's house in Barbados. 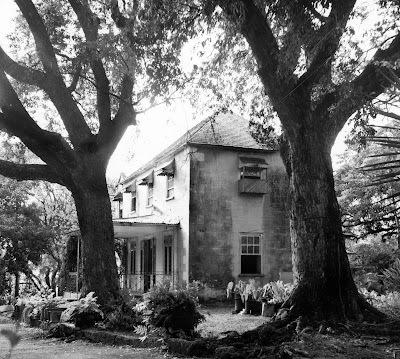 I was only 17 at the time, but the house haunts me still. Love your post! Many thanks for stopping by with such a lovely comment!